Adult toy collectors face several pitfalls while attempting to enjoy their hobby when compared to our childhood days. Finances are a biggie seeing how work, family responsibilities, and relationships in general didn’t factor in as much when we were kids. Our closest relatives bought most of the stuff we collected and we would store it in the unlikeliest places. Collection maintenance and display weren’t foremost in our minds. We were basically free to indulge in our love of little plastic warriors without checkbook balances, divorces, or unemployment to get in the way. Even more so, I feel that we didn’t obsess as much. Not when compared to what goes on in many a message board in today’s Internet age. We had it easier as kids. The only thing that never changes, from my vantage point, is peer pressure. Peer pressure changes plastic into metal. Like alchemy but not really. By 1981, I was back in the US of A, living in California, and starting to collect comic books and action figures. Other than going to school, those were good times. I was heavily into Star Wars, having several of the figures up to the earlier ROJ releases. I had the Millennium Falcon, the AT-AT, X-Wing, Cloud Car, the Turret and Probot set, a Tantaun w/open belly, and a couple of others that don’t spring to mind right now. I used the Darth Vader collector case as a vehicle by turning it upside down and pretending that it was a hovercraft of sorts. (Vader and the Imperial Commander would “ride” in the handle’s hollow back slot.) 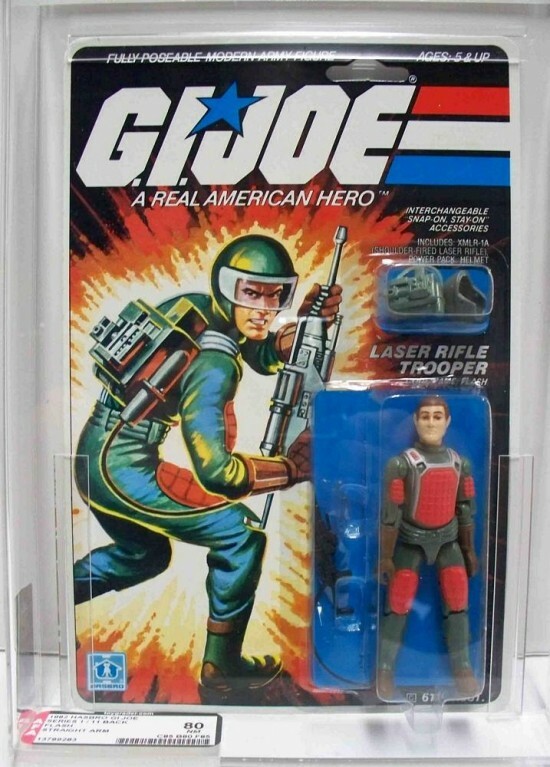 In 1982, Hasbro reintroduced a line called G.I. Joe in the 1:18 scale format and I quickly snatched up two of them: Flash and Short-Fuze. (Probably due to the Starsky/Hutch or Bo/Luke cliche of teaming up a blonde dude with a brunette equivalent.) These new Joes sported state-of-the-art military gear and featured nicer articulation, but I stayed with Star Wars for another year nonetheless. A friend of my grandmother later brought us a bag full of packaged donated toys and a MOC Zap became my third Joe figure. Times were tough for my parents around then and most of the toys I listed here were gifts from various family members who wanted to pitch in. Once you hit the big time you don't look back. 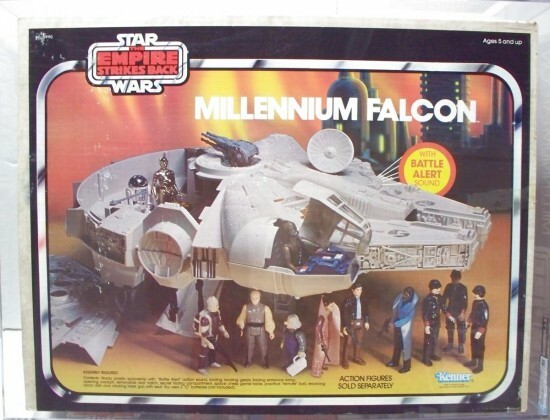 Action figures were mainly being produced in the smaller Star Wars/G.I. Joe format, but even at three to five bucks it was an expensive hobby. My parents were kinda flexible about this, but my aunt was a bit more realistic. On top of that, she never quite viewed figures as anything less than tiny dolls (or so she argued as our finances suffered) so she flat out asked me to switch gears and try collecting something different. Die-cast cars were a good bet, she thought. And the leading brand, then as now, were Mattel’s Hot Wheels. Before SUVs were cool, you had the Ford Bronco. She was fine with comics since they were teaching me how to read and write English at lightning speed. 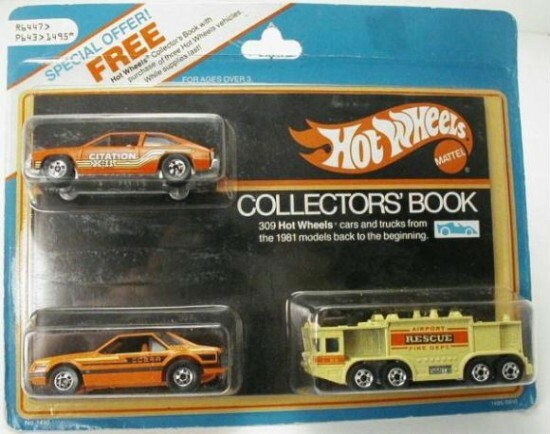 But Hot Wheels were mighty cheap, so I started off with a three-pack which included a collector’s book listing every car dating back to the line’s introduction in the late 60’s. I remember the commercial jingle: “Hot Wheels! …Good looking cars. Hot Wheels! 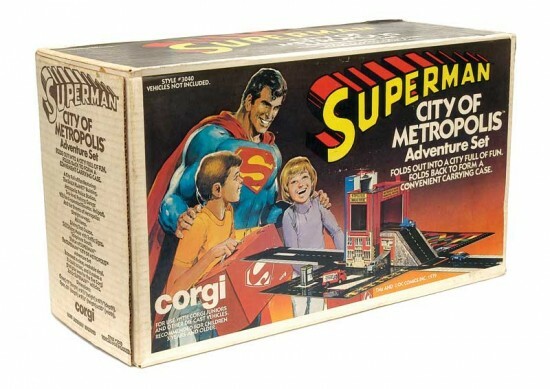 …for ’81.” My father shared my love of superheroes and tried to mix two flavors in one by getting me Corgi’s Superman City of Metropolis, (featuring solid Neal Adams artwork packaging artwork) probably one of the last cardboard & vinyl playsets ever released at retail as solid, injection-molded plastic became the norm for the toy industry. Hey, kids! This artwork is way neater than the actual toy! In a matter of weeks, my benefactors began to provide me with single packs, gift sets, a carrying case, and for Christmas, the City and Service Center playsets which connected to each other. They looked cool enough, but you basically dropped cars down a ramp and that was it. Not too exciting a prospect for a kid’s budding imagination. You had some features to work with like garages with flip-up doors and a working car wash, but the passion just wasn’t there for me. I did like that each car had a fancy moniker and not a mere model number. 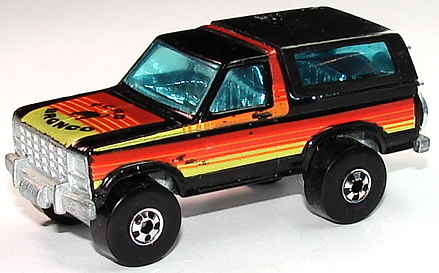 The ’81 Bronco and black Hot Bird were favorites, but like I said, there wasn’t enough enthusiasm to get me hooked on metal. The allure of those green-clad, olive drab “modern army action figures” alone kept burning a recess into my conscience. Flash was so awesome that most collectors cite him as their first Joe. Admit it. These guys made you stray from action figures as well. Next up: How two new toy lines shook up my world in 1983 and the animated TV shows that fueled my interest. Hot Wheels is the brand of choice for die-cast collectors. Hot Wheels scalpers are the pain of choice in the rear of both collectors and retailers. (Trust me. I once sold toys at retail for a living.) The best known site for dealers and wheelers is Hot Wheels Collectors. G.I. Joe is everywhere and the upcoming sequel flick with Bruce Willis and Dwayne Johnson guarantees further exposure. Yo Joe is the place to go for your Real American Hero archival needs. 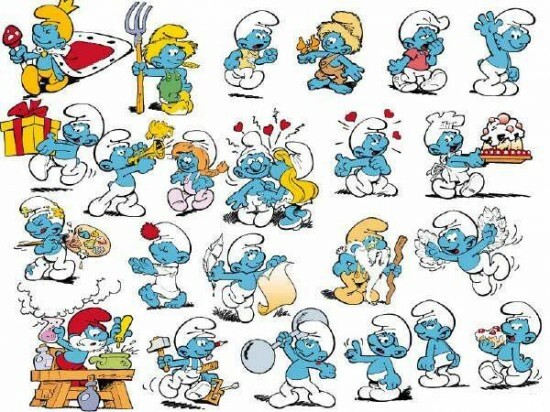 And in case their recent attempt at retaking Western pop culture worked its magic on you, Smurf on over to Blue Buddies to get your Smurfberry fix. And the wonders of Google Images.